Here lies Frank N. Berry. RIP. Halloween is one of my most favorite times of the year. I love the decorations, the costumes, the crisp Fall air, and of course, the festive goodies! These treats were made with Frankenberry cereal, but would be just as spooktacular with Boo Berry or Count Chocula. *You can use your imagination here. Use candy bones sticking up out of the grave, pipe RIP on the headstone - get creative! 2. In a large pot, melt the butter over medium-low heat. Once melted, reduce the heat to low. 4. Turn off the burner. Add the cereal to the pot. Gently stir until the cereal is completely coated. 5. Pour the cereal mixture into the prepared dish. Press firmly into an even layer (this is easier if you use an oiled piece of parchment or waxed paper). Allow the treats to come to room temperature. 6. Cut the treats into pieces using an oiled knife or cutter. 7. To Decorate: place the chocolate in a medium bowl. Microwave for 45 seconds, stop, stir. Microwave for 15 seconds, stop, stir, and repeat until the chocolate is completely melted and smooth. 8. Remove the creme center of the Oreos, place the cookies in a bag, and crush into crumbs. 9. Use a serrated knife to cut each Milano in half, making two tombstone shapes out of each. 9. Spread a treat top with about 1 tbsp of the melted chocolate. 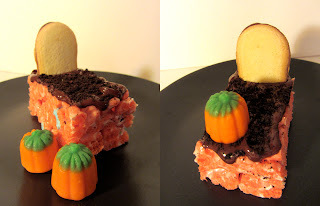 While the chocolate is still wet, sprinkle a pinch of Oreo crumbs over the top, affix the tombstone to one end, and add a pumpkin (or any other decoration you're using). Repeat with the remaining treats. 10. Allow the chocolate to set completely. Serve! To store: cover and keep at room temperature. These are best served within 24 hours.